Writing is challenging endeavor—one that requires a little bit of natural talent and a whole lot of study and practice. The same holds true for natural horsemanship. As a practitioner of both disciplines, I have learned that both require a certain amount of physical stamina, but more importantly, an intellectual understanding of foundation—and that sometimes, we have to go back in order to move forward. We must have the courage to find the holes and gaps in our foundation in order to repair it, build upon it, and make it whole. Achieving excellence in any art or discipline has its roots in a solid and sure foundation. I first started studying natural horsemanship in 2012. 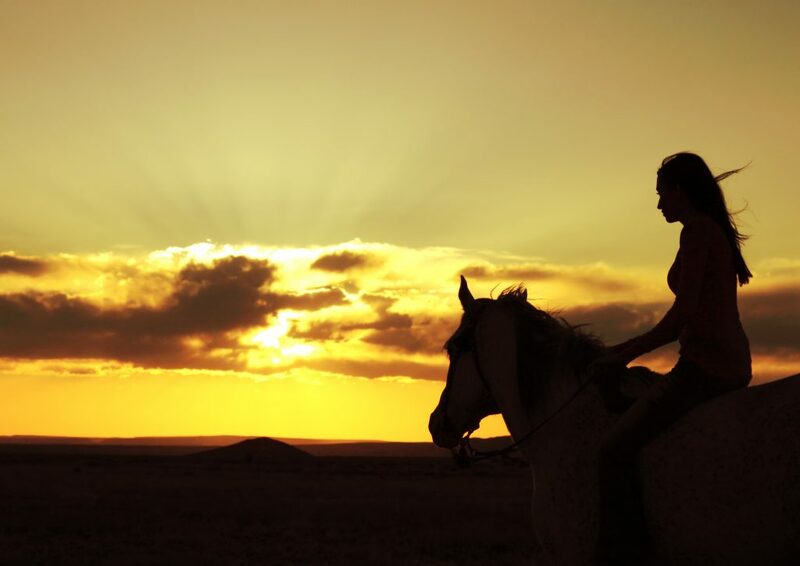 Before then, I felt my knowledge and skills as a horsewoman were well above average. I’d had horses most of my life. I had good handling skills and decent riding skills. I felt I knew my horses’ quirks, their strengths and weaknesses. I found it easy to learn new disciplines and I did well at competition—until I didn’t. Suddenly, I hit a wall. Something was wrong. Something was missing. I wanted more from myself, more from my horses, and more from our performance. So, I turned to natural horsemanship. Once I started learning about the philosophy and psychology of natural horsemanship, I realized what was missing. I had holes and gaps in my foundation. I realized I knew little of what it is to be a good partner to my horses. I knew almost nothing about horse psychology—how a horse thinks, or feels, or learns. I also didn’t put into practice the idea that horses are individuals, and like humans, have their own unique set of personality traits, emotions, and skill sets that should be taken into account when training them or working with them. My knowledge, my practice, and my “feel” suddenly seemed so rudimentary. Seeing the holes in my foundation was startling, humbling, and even a little dispiriting. It is never fun to find out you are deficient at something, especially something you are passionate about. Yet, recognizing my weaknesses only made me want to turn them into strengths. I had found a challenge. And, nothing excites me more than a challenge! As Natural Dressage Instructor Karen Rohlf says in her book, Dressage Naturally … Results in Harmony, “to find holes in your foundation, it is a gift.” It is a gift because we get a chance to go back and make things right. To fill in the blanks. To make something whole. She further explains that we must continue to work on our foundation and constantly nurture it to help it grow. For only then do we reallyhave something to build upon. Finding that my foundation with my horses was on shaky ground gave me pause, and also made me question the foundation of my other passion in life, writing. Could it be as unstable and incomplete as my equine passion? I suppose if one never looks, one never finds. So, look I did. And find I did. More holes. There is nothing more cringe-worthy to me than the experience of reading some of my earlier works; manuscripts, or stories, or articles I’d written when I was younger and more inexperienced. Looking back at those pieces of writing made me want to give up. Who did I think I was fooling? How could I have been so misguided? How could all those English profs I admired be so misguided? Once I got over the embarrassment of what I considered to be “good” writing, I found that I could also see in those past works little nuggets of natural skill, some wisdom in my innocence, and a whole lot of passion. Maybe the profs weren’t crazy, after all. It was enlightening to go back and see that younger, more inexperienced self. It showed me how far I’ve come and how far I still have yet to go. I can see the challenges ahead, and it lights a fire within me. I realized I want to be better at what I do. Always. So I started to seek out mentors. People who are more experienced than I in both of my chosen disciplines. People who are have the experience and knowledge to spot the holes in my understanding, training, and natural set of abilities. People who are willing to share with me what I can do to repair or fill in those holes, to help me build, re-build, and strengthen my foundation. Friends and family have often questioned why, in the past few years, I have attend so many writers’ conferences and workshops. They wonder why I spend so much time and expense, and sometimes travel away from home for extended periods of time, to work on my horsemanship. Haven’t I learned enough already? Don’t I already know and understand the basics? My answer is always, no. Not enough. There is never an end to learning, and the foundation of our training and knowledge is never as solid as we think it is. Things change, evolve and grow. The foundation beneath our feet is always shifting, and we have to keep up with it or lose our balance. Going backward can sometime feel like a failure, or a punishment. But, if we look at it as part of the journey, as part of becoming more whole ourselves, as a person, it doesn’t seem so bad. I’ve learned that in order to move forward with anything in life, we often must take a few steps back. We need to revisit and confront our weaknesses, work on them, and challenge them to become a bigger part of the whole. This requires work, but the work doesn’t have to be painful. I like to think of it as adding more squares and shapes to a hand-made quilt. Sometimes we have to go back and repair some of the stitches that have worn over time, but it only makes the new patches we sew on all the more beautiful and bright. It never hurts to go back to the beginning—especially with fresh eyes and a new perspective. After the last chapter is finished, it’s good to go back to the first chapter to see if the idea or story has circled back around, that the first part of the work has continuity with the last. When trying to learn or finesse a skill in the saddle, it’s good, and necessary—and only fair to the horse—to go back to the basics to check the foundation before asking him or her to learn and perfect something new. Having patience with the process and with ourselves is never easy. But it can be well worth the sometimes difficult task of going backwards. If you’ve fallen out of love with what you do, or if you feel the urge to give up on your passions and dreams, or if you think you just can’t get any better at something, maybe it’s time to go back. Take a hard look at your foundation. Look for the holes. And when you find them, I hope you rise to the challenge to fill them in, add to the quilt, and become the writer, the equestrian, or the person you hope to be. I’ve always been at my most creative when I have to work within structural confines, whether it be an extensive outline for a novel, or creating a character based upon someone in history. Within those structural walls, my mind is free to roam, without getting lost in all the noise outside. As writers of historical fiction, we will never really know what was going on in the minds or emotions of the people in history we want to portray. We see them through their actions, what they’ve written, or what they’ve reportedly said, but we don’t always know their deepest fears, or what they secretly wanted in life. We don’t always know their unrequited loves, their biggest regrets, or their pet peeves—unless it was written down. And even that can be up for interpretation because we can never really be inside the mind of anyone, much less a historical figure. Even non-fiction historical accounts can be skewed because every writer has a personal bias. They put their perceptions and interpretations onto the page. It’s human nature. But, interpretation can open the doors to a whole new kind of creativity. When I use a historical figure in fiction, I do extensive research to know as much about that person as I can. I read books and articles on them, and I watch television shows, documentaries or movies featuring that person. I make notes on what I think is most interesting about them and what is portrayed about their life. Then I start exploring what that person must have been going through psychologically at any given event or circumstance. I try to put myself in that person’s shoes and wonder how they felt about what was happening to them. I also like to create a new reality for them, and then based on what I know about that historical figure, I imagine how they would react to the situation I have created for them. Some of my favorite books feature historical figures as amateur sleuths. The author has, within the confines of history as we know it, put that character in charge of solving a puzzle the author has created. The author uses what they know about that historical figure’s personality and the events that surrounded them, and then they create a mystery within those confines for the character to solve. What a great way to delve into the heart and soul of a person! Some of my favorites have been Stephanie Barron’s series featuring Jane Austen as an amateur sleuth, and Karen Harper’s series featuring Queen Elizabeth I as an amateur sleuth. It was great fun to sink myself into the world of the historical figure I knew through stories and my own research, combined with situations created by a present-day author. I found it inspiring. In my historical series, I’ve used the famous and iconic figure Annie Oakley as an amateur sleuth and put her into situations she never encountered in real life. It was interesting and exciting to imagine how she would have reacted to being compelled to solve murders. I took what I knew about her, and surmised that she was gutsy, smart, lovable and loving, and incredibly talented at something a woman rarely pursued—sharpshooting. She also bested most men in her field. 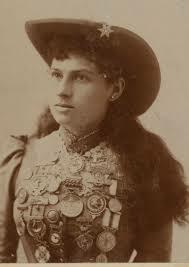 Annie Oakley did not live the life of an ordinary woman in 1885. Given the scope of the Wild West Show’s travels, and what Annie did for a living, I thought she would make an excellent amateur detective. One who is driven by seeking the truth and finding justice. The key is to be as accurate as possible given the information you have, and most importantly, to make your historical and fictional story believable.You wouldn’t make King Henry the VIII a pacifist or monogamous, or Fanny Brice dull or somber. Readers won’t buy it. Be smart about it. If you want to assert in your historical fiction novel or series that a historical figure can act like, or be something history did not record, make sure you do your research to see if the historical accounts of him or her support that idea. Then, dive deep into what you think that person is about, and what drove them. Let your imagination go.